You never know what might show up on your doorstep every morning—if you’re Jeanie Shaw, it just might be a turkey! The question is: Do you know where to turn and what to do, no matter what comes knocking? In a series of short chapters that feature anecdotes ranging from the humor­ous to the heartwarming, There’s a Turkey at Your Door takes you on a journey to explore the Bible’s many applications to daily life. As Jeanie invites you into her life and into God’s word, you’ll laugh out loud, shed a few tears, and discover lasting spiritual insights. So come on in, the door’s wide open. That was very kind. Thank you for the summary , Elizabeth. Later I’ll share some blurbs from a few who have read a sneak preview. Writing a book is a very vulnerable and often scary experience — dotted with many self-doubt obstacles along the way. There are numerous comparisons to actual labor and delivery. I usually write late at night…after work hours, so the process involves some lost sleep. It involves some teamwork and some money as well. The book-birthing process is at times painful and at other times exhilarating. Sometimes it’s just plain tiring. There is often a lot of waiting involved.…Then, comes the big day when the editing, the cover (the face) and the layout (the innards) are complete. The finishing touches are done and it’s sent off to be published. This seems sort of like going to the delivery room. It’s exciting and scary–at times you want to turn back. However, …the deed is done and soon a “newborn turkey” will be in my hands. When I was pregnant with my children we eagerly anticipated the pronouncement of their gender. Would they be a girl or a boy? Back then, we didn’t find out ahead of time. Before the birth of my first child I kept having a recurring dream. In this vivid dream I had just delivered our baby and my husband and I were eagerly awaiting the pronouncement from the doctor….”It’s a _____!” In my dream, the doctor kept saying…”It’s a…duck!” Yikes…wasn’t expecting that! We thought this a bit disappointing, but assured each other that we would love our new baby duck. Yes, that’s a strange dream and I’m certainly grateful to have birthed two daughters and a son…and later another son via heart-birth (adoption). I guess now is the time for birthing fowls. I already have a “Goose”…so it seems to make sense to add a turkey to the book family. 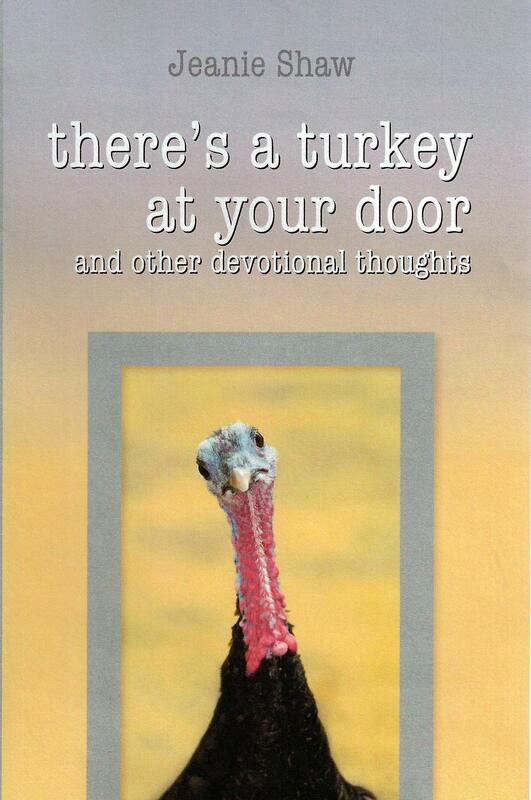 You may wonder why the title, “There’s a Turkey at Your Door”. There’s a good reason for it, but I guess you’ll have to read the book to find out what it means. The books are due to arrive mid-month. If you don’t want to wait you can go to https://www.createspace.com/4000079 and order it there. You can also pre-order a copy by sending me a note at the end of the blog. I’ll get back to you. So, today’s blog is a bit different than the usual. My Morning Cup…refilled will return soon. I suppose this is simply a pre-birth announcement. Congratulations, Jeanie, on the birth of your new duck, er, book!! I would love to get a copy of your new book. Let me know the price. Your writings are special to me. Congratulations jeanie. I read “goose”and look forward to “turkey”. Pls order me a fresh one. Great “birthing” Jeanie!! Know this new book, like your others, will inspire and encourage many other people!! You are gifted!